The first humans to arrive in Australia destroyed the pristine landscape, probably by lighting huge fires, the latest research suggests. 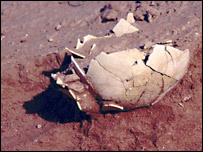 The evidence, published in Science magazine, comes from ancient eggshells. These show birds changed their diets drastically when humans came on the scene, switching from grass to the type of plants that thrive on scrubland. The study supports others that have blamed humans for mass extinctions across the world 10-50,000 years ago. Many scientists believe the causes are actually more complex and relate to climate changes during that period, but, according to Dr Marilyn Fogel, of the Carnegie Institution in Washington, US, chemical clues gleaned from the eggshells suggest otherwise. "Humans are the major suspect," she said. "However, we don't think that over-hunting or new diseases are to blame for the extinctions, because our research sees the ecological transition at the base of the food chain. 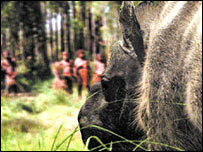 "Bands of people set large-scale fires for a variety of reasons including hunting, clearing and signalling other bands. "Based on the evidence, human-induced change in the vegetation is the best fit to explain what happened at that critical juncture." Dr Fogel's team, based in the US and Australia, examined hundreds of fragments of fossilised eggshells found at several sites in Australia's interior dating back over 140,000 years. They looked at the indigenous emu and the Genyornis, a flightless bird the size of an ostrich that is now extinct. The type of carbon preserved in eggshells gives a picture of the food the birds ate. Before 50,000 years ago, emus pecked at nutritious grasses. But after humans arrived, about 45,000 years ago, they switched to a diet of trees and scrubs. Genyornis, however, failed to adapt and died out. "The opportunistic feeders adapted and the picky eaters went extinct," said Professor Gifford Miller, of the University of Colorado at Boulder, US. "The most parsimonious explanation is these birds were responding to an unprecedented change in the vegetation over the continent during that time period." The data sheds light on the contentious issue of what led to the extinction of 85% of Australia's large mammals, birds and reptiles, after about 50,000 years ago, when human settlers arrived by sea from Indonesia. Mass extinctions on other continents also coincide with the arrival of modern humans, suggesting the two events are linked. In North America, for example, the disappearance of the likes of mammoths and ground sloths is coincident with the arrival on the landmass of new stone-spear technologies carried by humans about 12,000 years ago. 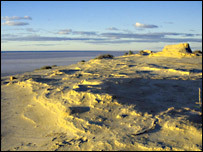 In Australia, scientists have debated whether climate changes, human fires or excessive human hunting were the cause of the continent's big extinction. Dr Fogel's team doubts the climate explanation but there are plenty of others who support the theory - such as Clive Trueman of the University of Portsmouth, UK. He says some large mammals survived long after the sudden changes in vegetation identified by Dr Fogel's team. "While there may be a connection between the arrival of humans and changes in vegetation, as demonstrated by carbon isotopes, sudden changes cannot be largely responsible for megafaunal extinctions as the beasts survived for at least 15,000 more years," he told the BBC News website. "It is likely that extinctions were not caused by any single event, but reflect compounding factors such as natural climate changes associated with the Ice Age fluctuations and, quite possibly, the arrival of humans," Dr Trueman added.